Coimbatore, October 10th, 2016: SIERRA ODC Private Limited, a software/IT solutions company, headquartered in Coimbatore – Tamil Nadu, will be participating in one of Dubai's top IT expos – GITEX technology week 2016 for the 9th consecutive time. SIERRA's stand in this exhibition will be at: Stand No: SR-E24, Sheikh Rashid Hall, Dubai World Trade Centre, UAE from 16 to 20 October 2016. GITEX, largest regional IT exhibition, is the place for every innovator to demonstrate their caliber by presenting their ideas, solutions, products etc. among fellow innovators and businessmen which would gain them the recognition they deserve to be part of the system that would inevitably alter the future. 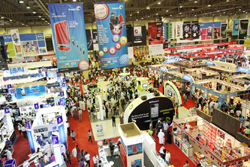 With the provisions from GITEX like conferences, exhibitions, product launches etc., it is the place for every tech enthusiasts and IT entrepreneurs to learn more of the cutting edge technologies that are yet to rule the world of IT, so that they could upgrade themselves among other world class competitors. SIERRA is always excited for sharing and learning of new innovations, which is why we will be taking part in this event to showcase our products eFACiLiTY – Enterprise Facility Management Software and WMCentral – Warehouse Management System. SIERRA ODC Private Limited is a software/IT solutions company that is providing world class software and solutions worldwide for more than 18 years. SIERRA is headquartered in India with offices in UAE, USA, Malaysia and Singapore building an extensive clientele around the globe. SIERRA is a Microsoft Gold Partner company with expertise in the field of Mobile Application Development covering major platforms like Android, Windows and iOS, and Web Technologies covering Enterprise Applications, Cloud Computing with Microsoft Azure and Amazon Web Services etc. SIERRA's services comprises offshore outsourcing, outsourced product development, offshore development center, IT managed services, and staff augmentation services. eFACiLiTY®, SIERRA's flagship product, is an enterprise grade CAFM/EAM/CMMS software that competes with world leading products in the Facility Management space. SIERRA's motive to address the problems faced by medium and large enterprises in managing their facilities, and the innovation that was required to increase an organization's productivity led to the inception of eFACiLiTY®. SIERRA's innovation and eFACiLiTY's uniqueness are the reasons for eFACiLiTY to be such accomplished software, whose goal is to become the World's Best Facilities Management Software. eFACiLiTY® is an exceptional software that can seamlessly integrate with popular Building Management System (BMS) / Building Automation System (BAS) from Honeywell, Siemens, Schneider Electric, Tridium, Carrier Race, Trane, Azbil etc. to provide comprehensive automation for various infrastructure like Airports, Hospitals, Hotels, Corporate Offices, Retail Malls, Commercial & Residential Complexes, Green Buildings, Factories etc. eFACiLiTY's extensive clientele includes many of the Fortune 500 companies like PepsiCo, British Aerospace Systems, MARS, JTI, Yum Group (KFC, Pizza Hut), Wipro, Vodafone, Reliance, Maersk, Mitsubishi, SIEMENS, Honeywell, Schneider Electric, Four Points Sheraton, Sodexo etc. Government clients include Dubai Airports, Ministry of Health-Bahrain, Ministry of Health-Kuwait, Malaysian Government, Saudi Arabian National Guards, etc. SIERRA are also the developers of , which is an end-to-end enterprise grade warehouse management system that can also integrate with Automated Storage and Retrieval Systems. This suite covers all warehousing activities which includes receiving, put-away, storage, inventory management, supply, replenishment, kitting, order fulfillment, picking, checking, packing and dispatch, by keeping track of each of the activities leveraging advanced data capture using Barcode labelling/RFID tagging and related technologies. SIERRA has provided its warehouse management solutions to top enterprises like Hero MotoCorp, Bharatiya Reserve Bank Note Mudran Private Limited (BRBNMPL – a subsidiary of RBI), Novartis, Syngenta, JTI, Hindustan Ciba Geigy and Civil Aviation Authority – Uganda. SIERRA's main focus for this event is to find new partners and resellers in order to promote its services and products (eFACiLiTY – Enterprise Facility Management Software and WMCentral - Warehouse Management System) worldwide. SIERRA also takes this event as an opportunity to find new end clients to share our innovations. We are glad to invite you to join us at GITEX Technology Week 2016. You can find us at Stand No: SR-E24, Sheikh Rashid Hall, Dubai World Trade Centre, UAE and we will be represented by our CEO & Managing Director, Mr. Giridhar; Head – Client Services, Mr. David Raja P and Head – Global Sales, Mr. Girish Krishnan.